The 2017 General Council Recognition Banquet was a success. 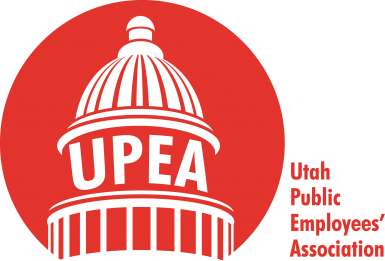 More than 150 delegates, honorees, and staff members celebrated the hard work devoted to the Utah Public Employees Association (UPEA) this year. Many honorees for the Public Employee Salute, The MACU/UPEA scholarship, and the top district recruiters attended to accept their awards. Matt Briggs, outgoing UPEA president, recognized board members and guests sitting at the head table. He then introduced UPEA Executive Director Todd Losser, who recognized all of the UPEA staff members and their dedication throughout this year. Alene Schwei and Tracey Vollarth, from Mountain American Credit Union (MACU), then presented all of the Public Employee Salute winners with their certificates. To read more about the Public Employee Salute winners, click here. Next, Kendle Zdunich and Eric Buchanan recognized the UPEA/MACU scholarship winners. To read about the scholarship winners, click here. Finally, Pam Sorenson and David Hoffman acknowledged the winners of the 2016-2017 recruiter incentive and awarded the Top Recruiter of the Year Award to Johnny Christiansen. To read more about the recruiter incentive, click here. After the recognition banquet, guests were encouraged to attend the president’s reception to congratulate Jeff Olinger, incoming UPEA president. Vikki Carrel, keynote speaker during UPEA’s General Council Opening Ceremony, presented on how to, “Build A Successful Teamwork Culture.” Carrel is a sought-after author and national speaker. She has conducted seminars across the nation and is a frequent contributor on regional and national television. She is the president of Vikki Carrel and Company, the creator of The Empowerment Project, and has recently written the book Puzzle Pieces. When we think about a “team,” people usually visualize a collegiate/athletic team. However, we could be on a team whether it’s part of a family, work, relationship, or friendship. “You win as a team, lose as a team,” Carrel stated. UPEA is a team, your co-workers are a part of your team, and you have to learn how to be successful with others. There is a “power of perception,” Carrel said. Ninety percent of the error in thinking is due to error in perception. Perception is your cognitive interpretation of the world around you. It can be influenced by your bias and background knowledge. Identify what is holding you back; develop skills to increase personal motivation, productivity, and success. Visualize your “zone of genius” by pinpointing your strengths, expertise, and skill set. See your value by recognizing your positive impact. Isolate key adjectives that describe your personality and personal brand. Own your value by identifying your contributions as a business leader. Note what you can do to increase motivation and productivity in your work environment. When building relationships, you have to connect and collaborate. You must see the values in others, move beyond confined thinking, and have effective communication. Ninety-three percent of people use nonverbal communication. It’s not what you say, it’s how you say it. Oftentimes we need to learn how to control our emotional intelligence (EI). “EI is the capability of individuals to recognize their own, and other people’s emotions, to discern between different feelings and label them appropriately, to use emotional information to guide thinking and behavior, and to manage and/or adjust emotions to adapt environments or achieve one’s goals.” EI can include body language, nonverbal signs, perceiving emotions, reasoning with emotions, understanding emotions, and managing emotions. Individuals need to understand when sense of humor is appropriate, have the ability to wait, know when to “stand your ground,” and avoid “winning for the sake of winning,” she said. We should all have character, competency, and commitment on a team. Once you acknowledge these helpful tips and information, you can start building the individual and team. If you are interested in learning more, please visit www.vikkicarrel.com. Jeff Olinger, incoming 2017-2018 UPEA president, recognized the generous vendors who donated giftsfor the raffle. Olinger also expressed than ks to each delegate and introduced those seated at the head table. “Let’s continue to educate our members,” Olinger said. “We need to remind them why they joined UPEA in the first place.” If members have concerns, we need to be present and knowledgeable with the correct information. After lunch, Deb McBride was introduced as UPEA’s newly elected second vice president and proceeded with a speech. After McBride’s speech, Olinger introduced Lorin Barker, UPEA’s legal counsel from Kirton & McConkie to swear in the new officers, Advisory Council members, and State Board members. Barker continued with UPEA’s 2017 Policy & Platform, with the assistance of Elaine Bonham, and later finished with the introduction of Standing Committee chairs and Advisory Council chair. UPEA delegates met to pass the UPEA Policy and Platform. UPEA’s attorney Lorin Barker from Kirton & McConkie conducted the meeting as the parliamentarian. 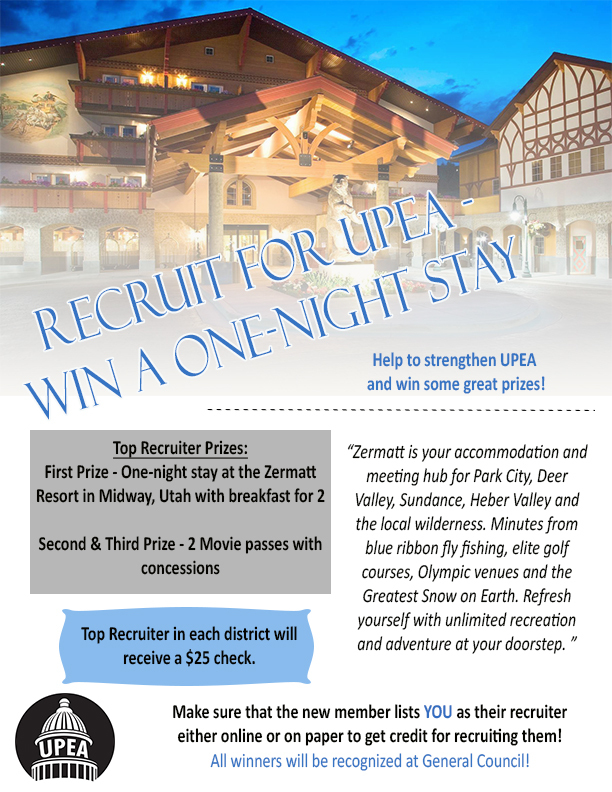 UPEA’s Policy and Platform defines the mission statement and general welfare of the association. Delegates meet annually at General Council to vote on any changes. All districts select delegates to represent them and each delegate represents and votes on behalf of 40 UPEA members. The second resolution discussed and passed by the delegates calls for conducting a district realignment study. This resolution sought to have the UPEA Board of Directors create a task force to “study UPEA’s current district structure, and also study potential district alignment and restructuring.” The original motion requested the task force present its findings to the UEPA Board of Directors. However, after much debate, the delegates added language to the resolution that once the UPEA Board of Directors accepted the report, it would then become available to all UPEA members via the Association’s website and at next year’s General Council. As a member-based organization, UPEA offers the opportunity for members to get involved on the UPEA Resolutions Committee and recommend resolutions for discussion at General Council meetings. If you are interested in submitting a resolution to the Resolutions Committee, contact Executive Director Todd Losser at 801-264-8732 ext. 204 or todd@upea.net.